Tulsa, Oklahoma; August 3, 1965. 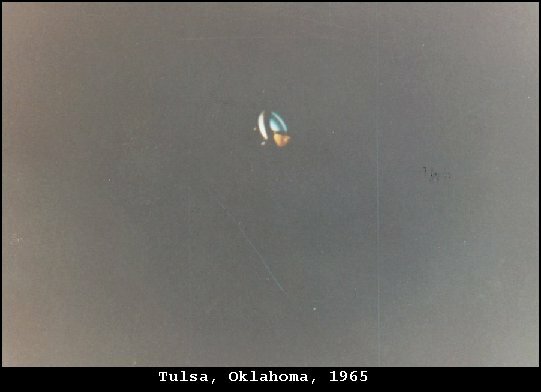 The Tulsa Oklahoma photographic case is an extremely interesting one in that we have one excellent photograph of a multi-colored object which fails to resemble any known flying object, past or present. At about 1:30 AM, Mr. A. L. Smith, accompanied by his 14 year old son Alan, and three other witnesses , were captivated with watching an unusual, multi-colored UFO. Mr. Smith was a turbine engine specialist, working with American Airlines. The unknown object seemed to be slowly moving toward the five witnesses. Still some several hundred yards away, it paused briefly and hovered. At that precise moment, Alan snapped a photograph with his inexpensive camera, using ASA 64 film. Alan decided not to try for a second shot. He took his camera inside the house, and ran back outside just in time to see the object rapidly flying away into the night sky. His picture was extensively analyzed, pronounced authentic, and later published by Life magazine and many newspapers.